Mesmerize facilitates the editing process, to the extent it offers 3 different places where you can edit content sections. One of these places is directly in the customizer preview. Text, buttons, images can be adjusted in the preview mode, so you can easily compare the changes against the overall look of the page. 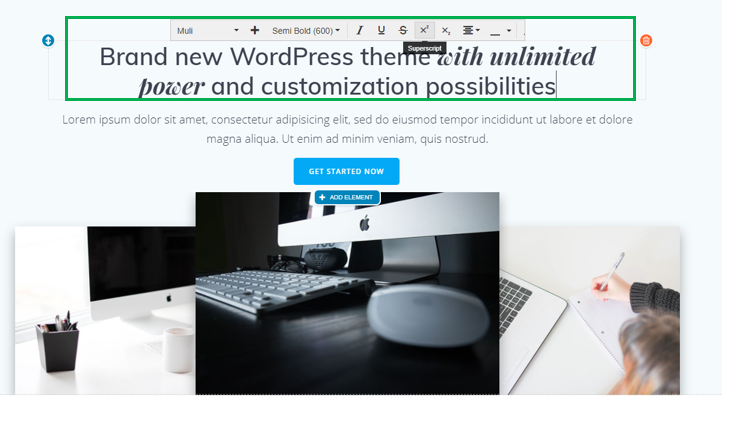 For enabling the editing mode, you have to click the pencil icon inside an element (text, image, button) and start playing with different content versions. Change the default color of the text. Do not forget to press “Apply changes” once you have found the right customizations for that button. For images, when you click the pencil icon inside the element, a popup will open where you upload and adjust the images to be inserted in the section. You can edit the image properties.